profits from the sale must used to support the monastery and/or social programs. The Netherland’s has the only other one in the world. While they are all yummy, they have different styles. 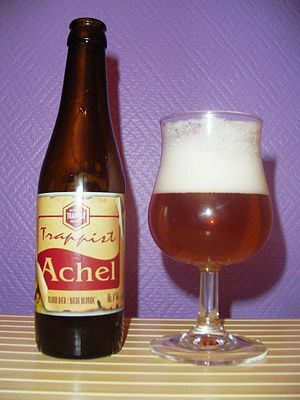 Achel was an established monastic brewery until the German army looted its copper kettels during WWI. They restarted brewing in 1998 and have continuously improved their operation. You are starting to be able to find this brand with more ease in the US. 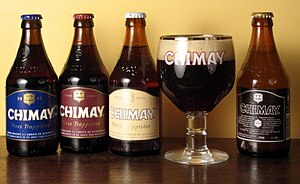 Chimay, the largest and best-known Trappist brewer, now uses non-monks to do most of their brewing. This has created a bit of a backlash with two main effects arguments: (1) creation of a controversy whether they merit their Trappist designation, and (2) whisperings of a decline in quality. They make three types: red, white and blue (by far the best). 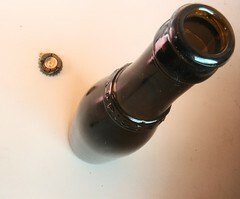 If you are looking to bring something other than wine, a large bottle of Chimay Blue is a nice and pretty easy to find. 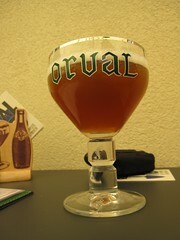 Orval is only known for one kind of beer. It is dry, light and hoppy (which makes it different from other Trappist ales). 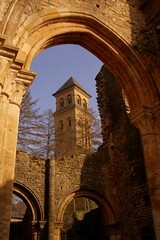 The monastery of Orval has the beautiful ruins on their grounds that are worth touring. Their symbol is a fish with a ring. This is because a noblewoman allegedly lost her ring in a pond. A fish brought it to the surface. To show her gratitude, she funded the monastery. That’s their story and they’re sticking to it. Rochefort (not Roquefort where they make the yummy but stinky cheese) makes rich ales. 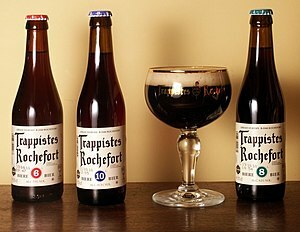 I like them all, but if you have never tried them, Rochefort 8 (a bit lighter) and 10 (stronger and darker) are good bets. 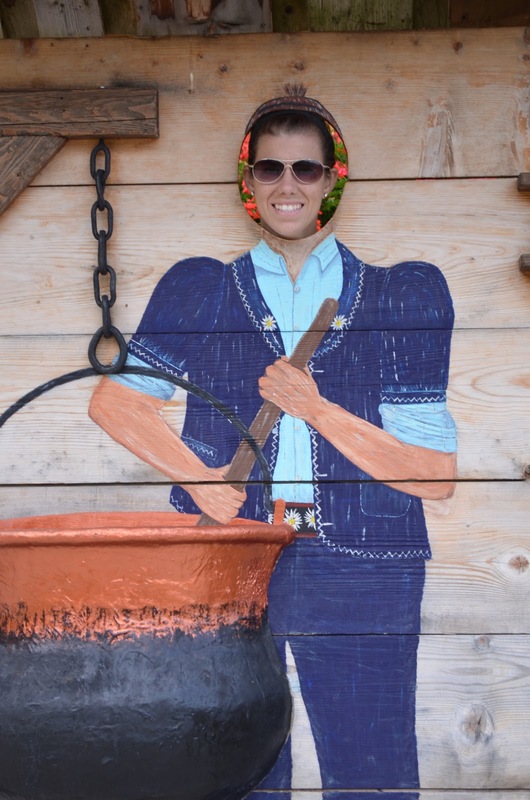 Michael Jackson (the Beer Hunter, not the singer) wrote a great article about his visit there. Westmalle is the originator of the widely imitated Trippel style. (You are now officially warned about the high alcohol content of all Trippels, Dubbels too. In fact, be aware of the high alcohol content of virtually all Belgian beers. Trust him on this one.) Any of their beers are a good ones and relatively easy to find. 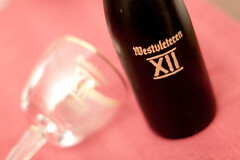 Westvleteren is the best beer we have ever had. They don’t market or distribute this beer. To lay our hands on a bottle, our friend Steamer traveled to Belgium, went on a specific morning at a specific time (they don’t sell it any old time) to the abbey and bought all he could. Don’t quote me on this, but I think there was a six bottle max. It was so good that he drank them all over the course of his vacation. Luckily, he stopped in a shop in Amsterdam at the end of his trip. They had just sent someone to the monastery to buy a limited amount. He managed to buy one and bring one back to the US for us to taste. Steamer is such a good friend! If you tasted it, you might not share. This beer is so good that it will set the bar by which all beers you taste will be measured (and found wanting). For more in Westvlandren, here’s a link to an article about someone’s visit.